After 46 years in law enforcement, including 9 in Mankato, Todd Miller is ready to retire. 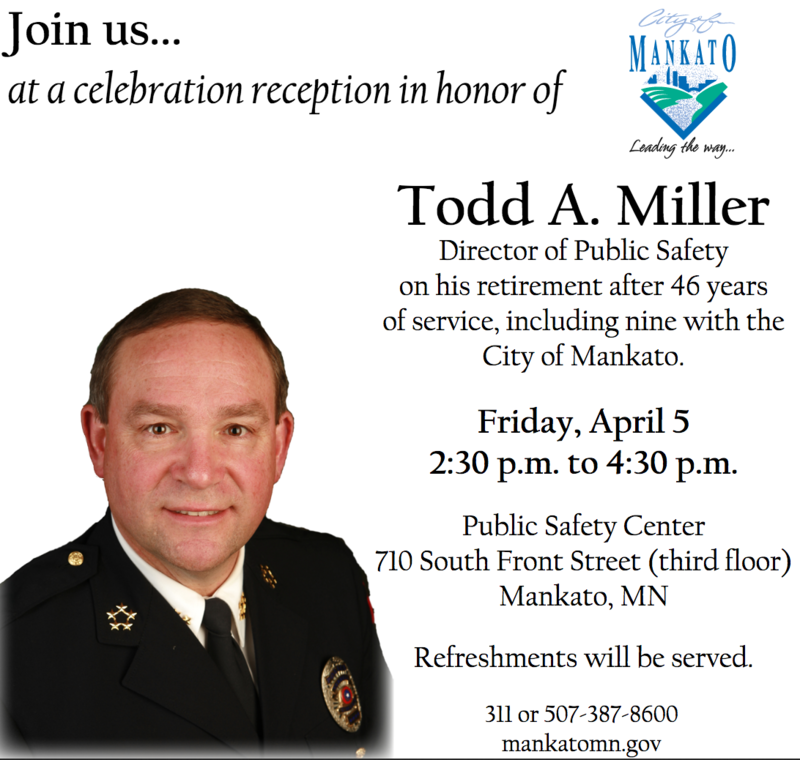 A retirement reception will be held for Friday April 5th at 2:30 for Miller who has been chief of police in Mankato for nearly a decade. "I've enjoyed working with community, crime is just part of what we do in law-enforcement but, crime isn't a police problem - it's a community problem. So we have to work together on those things and that's what I've really enjoyed is working with community, solving problems, implementing change to really promote that this isn't law-enforcement that's part of what we do but it's really police service, how do we serve the community, how do we make the community a safer place for everybody and I have enjoyed doing that," Miller told KEYC-TV. "It's a very safe community, very proud to of worked in Mankato, very proud of the staff I have here. Working with the city manager and the council, all the other city departments with our community governance philosophy. Hopefully I've developed the staff to where they can take over and lead the organization and the community to the next level and that maybe I've left it a better place than it was in 2010 when I came," Miller added.